A loving gift for the faithful gardener. Flowerpot-shaped mug with saucer is adorned with encouraging words: "Plant faith. Grow hope. Harvest love." The saucer doubles as a lid to keep the contents warm. 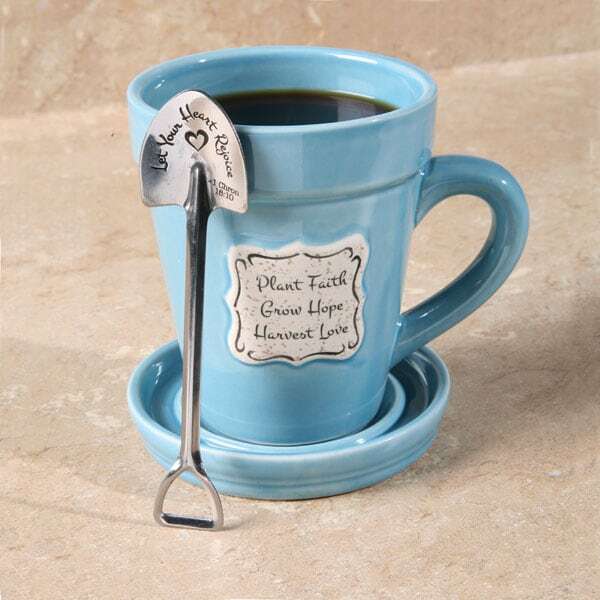 The spade-shaped spoon is stainless steel, engraved on back with "Let Your Heart Rejoice--1 Chron 16:10." 4½" mug holds 14 oz. Dishwasher and microwave safe. Of course, you can also use it all to grow and tend a plant.